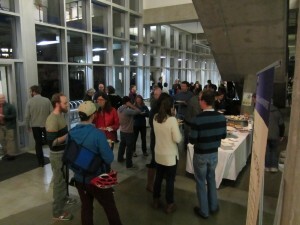 Between snow storms, the PCC community gathered to welcome and congratulate — read more here. 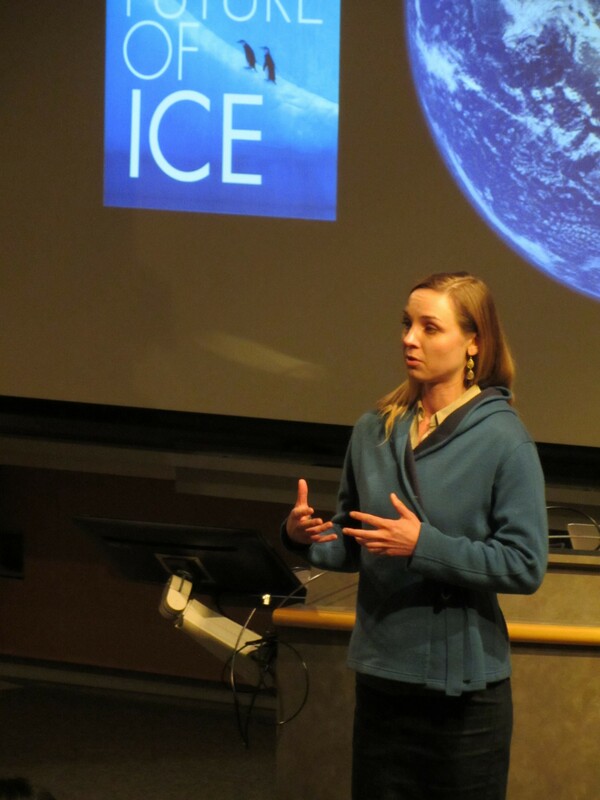 Cecilia Bitz who began her tenure as PCC Director in Sept 2017 shared her sense of the mission of the Program on Climate Change, to “Help society tackle climate change…” and to strengthen connections across campus, at the 2018 Winter Welcome on January 24. 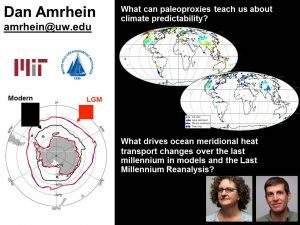 The climate community across UW is invited to this annual event, where postdocs working on problems related to climate, new graduate fellows, and recent graduate certificate recipients are acknowledged. Four graduate students completed their Graduate Certificate in Climate Science this year–three are students in masters programs who have graduated, and one PhD student in Philosophy, Alex Lenferna was present to receive his certificate. Michelle Dvorak from SMEA developed a presentation on “Value of Arctic oil development in the context of advancing climate change and ecological risks” for her capstone, in SMEA. Emily Rich (Evans) Worked on development and evaluation of a Climate Impacts Group (CIG) graphic for Washington State Governor Jay Inslee’s Staff. Amy Brodbeck (SMEA) created videos and lessons for school children which highlight local climate change in a small Alaskan community. 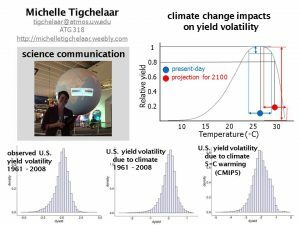 Alex Lenferna (Philosophy) worked with Karl Lapo (ATMOS) to connect projections of the potential future impacts of climate change in Washington State to proposed state-wide efforts to mitigate climate change, and to share that with many audiences. Susannah Morey (ESS), Andrew Hoffman (ESS), Andrew Pauling (Atmos), Justin Penn (Ocean, interdisciplinary fellowship) and Emma Kahle (ESS, interdisciplinary fellowship). Please visit the website for more information on PCC people, new initiatives, and interesting events. ATM S/ESS Prof Emeritus Steve Warren is a member of the elite “300 club”. What does the 300 refer to? Those new to the community of scientists and students were introduced, including 5 PCC fellowship recipients, Heidi Roop the new Climate Impacts Group strategic communications lead, and nine postdocs working on climate related topics. Keep an eye on our calendar of events for upcoming events, including the new “Climate Conversations” Series, Spring Symposium (new! ), Graduate Student Seminars, Summer Institute information, and more. Did you know the answer to the first question of the trivia quiz? Thank you to Dargan Frierson for submitting the question! The Winter Welcome is one of the PCC’s opportunities to bring climate scientists together from across campus, around common research and education goals. This years’ event, held February 10, 2016 in the FSH auditorium and lobby, included a general PCC program overview by LuAnne Thompson, PCC Director, including introductions of 2015/2016 Graduate Fellows (Hillary Scannell, Ocean, Advised by Mike McPhaden; Michael Diamond, Atmos, Advised by Rob Wood; Rebeca Cecilia De Buen Kalman, Evans, Advised by Alison Cullen). This year we also engaged the growing population of climate postdocs from across campus and congratulated the many graduate certificate recipients. Postdoctoral research scientists from across campus were invited to showcase their work and interests using one slide, giving a quick talk. Not only did we get to learn more about what postdocs are doing, many postdocs learned for the first time, what the PCC is all about. 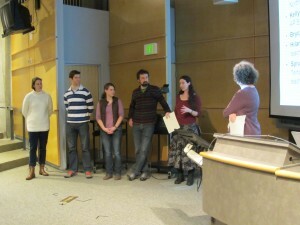 LuAnne Thompson, PCC Director, also recognized five graduate students (Katherine Heal, Ocean; Elizabeth Maroon, Atmos; Alison Saperstein, Evans; Hayley Dosser, Ocean; Kristin Poinar, ESS) who completed the interdisciplinary training requirements of the Graduate Certificate in Climate Science in the past year. Read about completed capstone projects here. 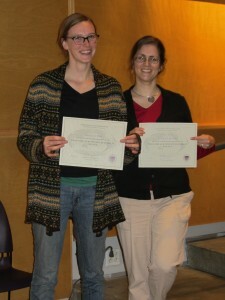 Katherine Heal and Elizabeth Maroon received their GCeCS certificates. 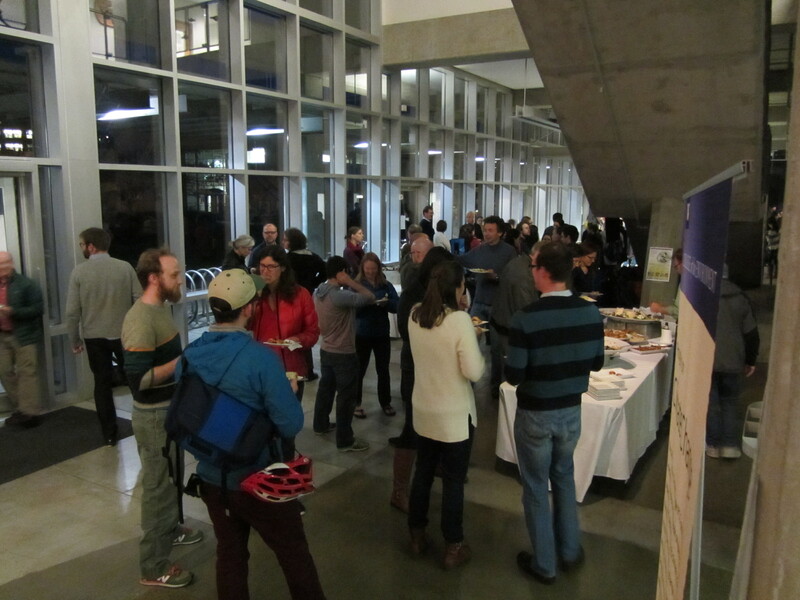 Catching up with climate colleagues from across campus. The Winter Welcome is one of the PCC’s opportunities to bring climate scientists together from across campus, around common research and education goals. This years’ event, held January 29, 2015 in the FSH auditorium and lobby, included a general PCC program overview by LuAnne Thompson, PCC Director, including introductions of 2014/2015 Graduate Fellows (Marlies Kovenock, Biology, Advised by Abby Swann; Emma Kahle, ESS, Advised by Eric Steig; and Ashly Spevacek, Atmos, Advised by Dargan Frierson). This year we also engaged the growing population of climate postdocs from across campus and congratulated the many graduate certificate recipients. GCeCS awardees describe their capstone projects in communicating climate science to non-science audiences. LuAnne Thompson, PCC Director, also recognized the seven graduate students who completed the interdisciplinary training requirements of the Graduate Certificate in Climate Science in the past year. Read about completed capstone projects here.